The smell of salt air hits our senses like a savory spice. We are at the edge of downtown Puerto Vallarta. Does the name sound familiar? This is the small fishing and pearl-diving village that became famous due to a movie made in the 1960s called “The Night of the Iguana”. The smell of salt air hits our senses like a savory spice. We are at the edge of downtown Puerto Vallarta. Does the name sound familiar? This is the small fishing and pearl-diving village that became famous due to a movie made in the 1960s called “The Night of the Iguana”. The movie, the stars, the glam brought bright lights to Puerto Vallarta, a town that kisses the wide curve of Bahia de Banderas in the state of Jalisco, Mexico. Richard Burton, the movie’s star, bought a house here for his soon-to-be-wife Elizabeth Taylor – who perhaps wanted to keep an eye on her yet-to-be- hubby. After all, his co-stars were Ava Gardner and Deborah Kerr. Like a black and white movie turned into Technicolor, Puerto Vallarta has grown from the sleepy 1960s into a sparkling, elegant destination with a full plate of cuisines, cultures and celebrations. Then as now, all good things begin with food. And so we sit outside at Villa Premiere, a boutique hotel and spa near historic downtown. 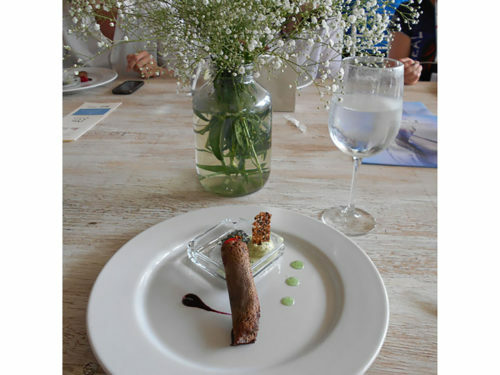 Our lunch tables are crisply laid with white linen tablecloths, tall wine glasses waiting to be filled and vases overflowing with baby’s breath. The first course arrives – scallop grilled over mashed potatoes and macadamia nut wreath with turkey sausage and avocado foam. Oh, yes, Toto. We’re not in Kansas anymore and we know it. The dining pavilion opens to a wide view of Bahia de Banderas, a huge bay ringed by peaks – the Sierra Madre mountain range rising tall, pale green and majestic then dropping in breathtaking descent into the bay. It can’t be measured in a measuring cup, but surely a beautiful view like this enhances every bite? Smiles, foodie conversations, flowing wine – by the time we get to dessert – a little taste of Cuba, Habana chocolate and basil ice cream, we’re ready to applaud Executive Chef Tony Martinez and we do. He’s pleased – to us it is one grand lunch but he works his kitchen magic every day. For me, the foodie memories that linger from lunch – the grilled scallop, just so, and my first taste ever of basil ice cream. I will go home and look at my basil plant with new respect. Who knew you could partner a common herb with ice cream and get a winner? After lunch, we find ourselves walking the walk in Centro Historico – the Puerto Vallarta downtown historic center area with art galleries, restaurants, gift shops, the main square, the cathedral Nuestra Señora de Guadalupe and the Malecon promenade. Good walking shoes are a must as sidewalks are narrow, often cracked plus some hillsides to climb. 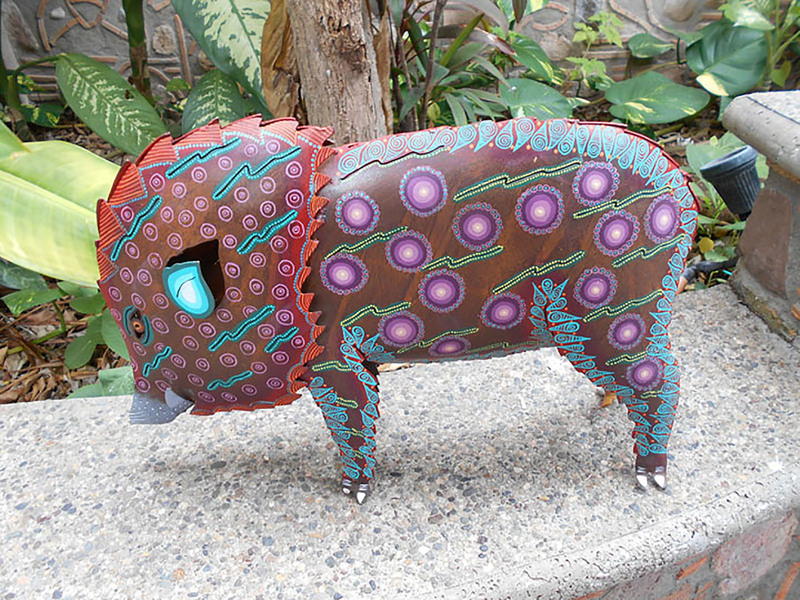 Our first stop is Colectika, an ancestral contemporary art gallery at Guadalupe Sanchez 858. Co-owner Kevin Simpson shows us prints by Enrique Flores – dream images with vivid colors. He then invites us into the Room of the Dead. I hesitate at the door, unwilling to communicate with the dead. But Simpson explains the whole use of skulls and skeletons is about resurrection in Mexican folk art. He shows us a skull covered with beautifully made butterflies. The point – out of death comes new life. For vacation planning it is good to know that from the end of October through the end of May each year the Historic Center Art Walk happens on Wednesday evenings from 6-10 p.m. Galleries (nine at this writing) are open along with restaurants included two recommended ones – Café des Artistes and The River Café. Free brochures have addresses and a map. Most galleries are open year round and are within easy walking distance of each other. We step into Galleria Pacifico at Aldama 174 Centro. Outdoor spaces have bronze sculptures hanging on walls and perching on pedestals. All are athletes in various poses, lifelike yet somehow very evocative in an ancient way as if they came fresh from the Greek games in Olympia and are simply posing for a selfie with you then they’ll be on their way. Gary Thompson owner of Galleria Pacifico guides a free Malecon sculpture walking tour during the season (Oct. through May). 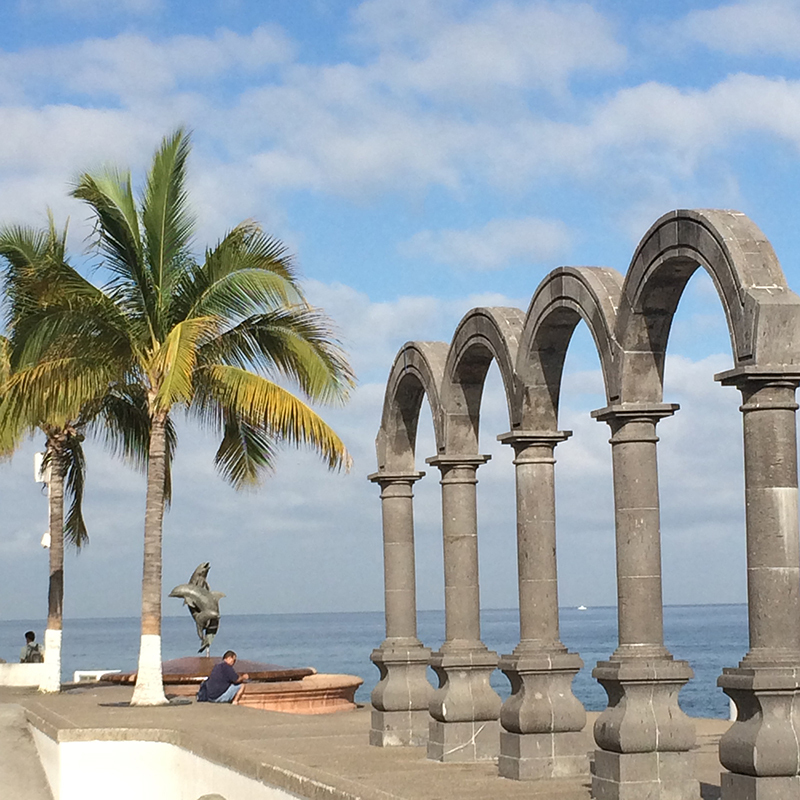 Meet Tuesday mornings at 9:30 a.m. at the Millennium sculpture next to the Hotel Rosito. When the walk is over, adjourn to Galleria Pacifico where a sculptor, often Jim Demetro, who created Vallarta Dancers, will talk about his work. At Galleria de Ollas, Corona 176, Centro, the space is small but worth a slow, careful look. Here are works by Mata Ortiz potters, a rural village in the state of Chihuahua, Mexico. The intricate designs, all created freehand, are museum quality and unique – unlike anything I’ve ever seen. More galleries are nearby but I opt to walk one block down to the Malecon, a wide promenade along Puerto Vallarta’s waterfront dotted with bronze sculptures and a walkway full of embedded designs. Some of the pebble designs in the walkway are symbols from the Huichol Indian tribe that go back to pre-Columbian beliefs – like corn, a gift from the gods and peyote, a cactus eaten to communicate with the gods. Commissioned sculptures sit like landmarks along the walkway. A sculpture called “In Search of Reason” by Sergio Bustamante, Guadalajara, 2000, attracts tourists this day for a photo moment. Nearby the “Rotunda of the Sea” by Alejandro Colunga, Guadalajara, 1997, has us scratching out heads. But still, shutters click. Memories are being made here. Like the series of dishes at lunch, this art walk is just a taste. There is more, much more. Consider taking a local culture walking tour with Learn Vallarta. Some tours are given in French and German. To become a local in three hours (I’m not making this up) take a culinary and cultural tour (three to choose from) with Vallarta Food Tours. Go off the beaten path to eateries, taco stands, meet the owners and their staff. It is true you have to rent the 1964 movie to get just a glimpse of the old fishing village yet a walking food tour taken today has ingredients of the traditional Mexican culinary experience. That hasn’t changed. But the population has. Over 40,000 expat residents (15 percent of the population) now call Puerto Vallarta home. And some 1.5 million visitors a year find their way here. Many stay at a ring of well-appointed hotels that dot the northern end of Bahia de Banderas. Tourism employs 70 percent of the city’s workforce. When I asked wait or hotel staff if Puerto Vallarta was home the answers came proudly – yes, this is home, born here, raised here and raising a family here. For me, this was my first visit ever to Puerto Vallarta. I have to say – This is an awesome place. What took me so long to get here? I, for one, am eager to return. Another food tour and more art galleries are on the menu. Note: My lunch companions were fellow travel writers and photographers. We were in Puerto Vallarta for the North American Travel Journalists Association conference. During our stay there were no travel restrictions, incidents or limitations. We were welcomed at every venue.